Wanneroo Veterinary Hospital has been looking after the needs of the pets of Wanneroo and their owners for decades. As some clients of ours will well remember, Wanneroo Veterinary Hospital was opened in a small house unit on Wanneroo Road in 1978, and initially run by various managers as a vet clinic for several years. In 1980 Dr Bruce Young took over the management of the practice until he purchased it entirely in 1984. In 1996 the practice moved to brand new modern premises, which is the purpose-built facility in use today. This move allowed the VET CLINIC to be upgraded to gain HOSPITAL status. Also, we expanded its staff levels to help serve the increasing clientele numbers and facilities required for modern medicine and surgery more completely. All these facilities equips us to meet the needs and expectations of our clients in the 21st century. 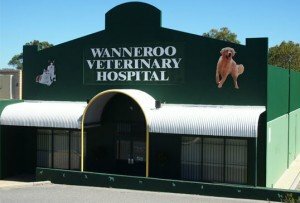 The staff at Wanneroo Veterinary Hospital, under the stewardship of Dr Bruce Young and Dr Stephen Cooper, is a stable and entrusted team of Veterinarians and Nurses. Our Head Nurse and Practice Manager, Sue-Ellen Smith is a familiar face that our clients know well and have relied upon for many years.